Smart City News – Jarman International K.K. If you are out and about, or even have a vague intention of spending some of the day outside, the weather at the moment, and also what the weather may be doing later in the day, is valuable information. However, just a simple report that it will be clear or cloudy sometimes isn’t very reassuring, particularly if you are planning something such as an outdoor adventure, and small event, or even just deciding what to wear. Responding to this most basic concern of civilians, “Weather News” is emerging as a new system to utilize social devices to create a constant stream of updates from self proclaimed weather reporters. This can be likened to a kind of weather “twitter” that is supplemented with pictures, explanations, and predictions from what has already grown to a network of over 130,000 users daily. In this regard, “Weather News” can actually avoid using complex weather satellites due to the largely user-submitted content of the site. It does in fact make use of its own radar system (about 80 weather radars across the Japan), and they focus on low altitude weather analysis, identifying sudden changes in weather. 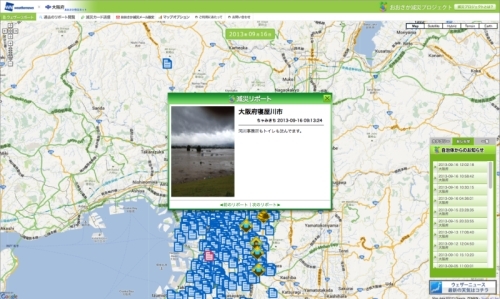 In combination with user submissions such as “looks like a cloudburst is coming”, or ” A black cloud is forming over Shibuya”, a decently accurate prediction of sudden changes can be made in real time. In addition to simply being a great resource for checking weather and conditions of a specific area at any given time, the fact that the actual radars of Weather News focuses on sudden changes and potentially hazardous weather creates an incentive to be a part of Weather News as a regular user. You can receive immediate updates to the extent you choose, and even for your area as the service develops. Let’s say for example you are in your office working away the afternoon hours and haven’t had a chance to look at the weather. If a massive cloudburst was on its way, you could receive a notification to that extent, possibly changing your plans for the evening. Or perhaps you are in your house in the morning preparing to leave, but you receive a mail from Weather News indicating that the typhoon seems to be shifting just away from Tokyo…you could then choose to ride your bike, or even take a pack lunch to enjoy your lunch break outside. Detailed and immediate weather updates has its own implications for better directing our daily routines, but aside from that, Weather News is endeavoring toward a more serious weather alert system: disaster risk and response. In addition to the low altitude radars currently in place, Weather News is aiming to set up various other forms of sensors with the intent of monitoring disasters and other hazards, and then incorporate that information seamlessly with the Weather News community portal. Volcano sensors, tsunami sensors, sensors to monitor shaking, and interestingly enough even a newly developed sensor to monitor pollen movements during the hay fever season. Another unique potentiality that is being explored is the function of this community based weather monitoring to communicate concerns to local municipalities. The article gives the example that along with reports of say torrential rain, if areas in districts tend to have excessive flooding or poor drainage systems, that information can be relayed instantly to city council members to best direct local repair efforts. An example of corporate usage of this service is given as well. A factory that operates semiconductors is very vulnerable to loss during a lightning storm, due to the excessive charges sustained from the lightning itself. They even mention that each time a lightning connects with a semiconductor, a million dollars is lost. Hence a service which can instantly warn of an impending thunder storm is invaluable to factories and plants that operate with delicate machinery, yet can’t afford to shut down simply at the forecast of a thunder storm approaching. This is the age of immediate data transmission in real time, and the weather is one that we should all try and stay on top of to the best of our abilities.